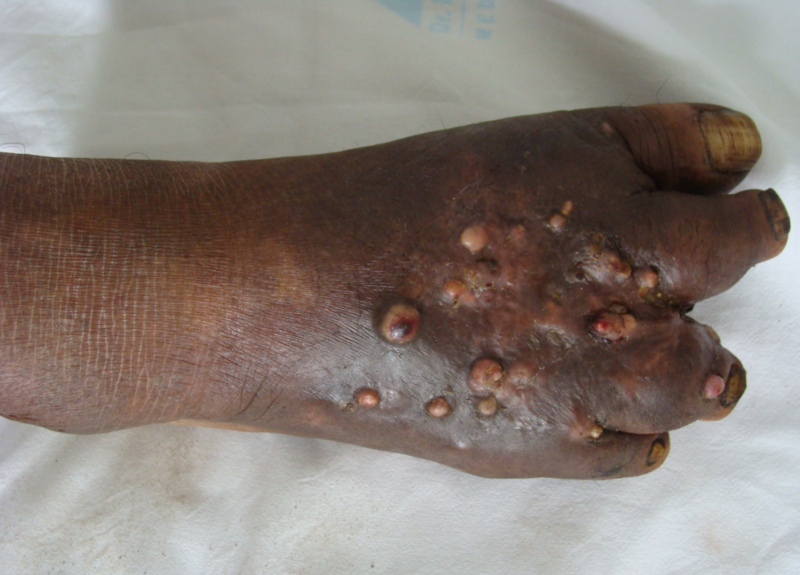 Mycetoma is a chronic granulomatous subcutaneous disease caused by bacteria (actinomycetoma) or fungi (eumycetoma). The disease progresses over months to years from a localized painless swelling to plaques, nodules and multiple discharging sinuses extruding grains (Figure), subsequently spreading to underlying muscle, tendons and bone, causing permanent deformities. Because of its typical tropical and subtropical distribution extending between 15º south and 30º north latitude (a zone called the ‘mycetoma belt’), comprising developing countries mainly, and its neglected status, the World Health Organization (WHO) declared mycetoma as a neglected tropical disease.1-3 However, its true distribution extends beyond this belt. A rough estimate of mycetoma epidemiology by van de Sande indicated the most cases in Mexico, Sudan, Senegal and India, with few reports from Uganda, Romania, Nigeria, Bulgaria and Thailand.3 The frequency varies with different geographic locations.3-15 Actinomycetomas are predominant in dry areas, especially in North Africa, Central and South America and a few Asian countries, while eumycetoma prevails in tropical and subtropical regions of Asia (Mid-East, India) and Africa (Sub-Saharan Africa), where rainfall is abundant.16 This is in contrast to the distribution in India, where eumycetoma is common in the dry western regions of Rajasthan, while eastern Rajasthan and southern India report a high rate of actinomycetomas despite sufficient rainfall in these regions.3,17 Although the meta-analysis by van de Sande gave an overview of epidemiology, the true magnitude of the disease is still ambiguous, as majority of the cases from the endemic regions are not reported in literature. An early diagnosis of the disease is necessary to prevent disfigurement, and identification of the etiologic agent is required for guiding management. The diagnosis is quite challenging in developing countries, where there is a lack of facilities, forcing the clinicians to assess the disease clinically and manage the patient without accurate identification of the pathogen or determining the extent of disease by imaging. Ultrasound and fine needle aspiration are the minimum requirements to accurately diagnose the disease. Other imaging modalities include X-ray, computed tomography (CT) and magnetic resonance imaging (MRI), which are lacking in peripheral and remote areas of developing nations. Culture methods, the gold standard for identification, have limitations of long turnaround time, difficulty isolating the true causative agent from contaminating bacteria and saprophytic fungi, and the need for experienced personnel. Matrix assisted laser desorption ionization-time of flight mass spectrometry (MALDI-TOF MS) is a rapid technique of identification but is available only in a few reference centers. Other modalities like histology, cytology, skin test and serology lack specificity for identification. Molecular methods may improve diagnostic capabilities, but are too expensive to be available at all centers in developing countries. The treatment is chosen only after distinguishing if the disease is an actinomycetoma or a eumycetoma. Surgical debridement and medical management by antibiotics or antifungal agents are the cornerstones of mycetoma treatment.2 However, the rate of recurrence is quite high, probably due to poor compliance or poor response to the drugs. The prognosis of actinomycetoma is better than eumycetoma. There are many gaps in knowledge regarding the epidemiology and management of mycetoma. The exact magnitude of disease burden in Asia is still a mystery that needs to be solved to fill in these gaps. Clearly, awareness must be raised among health professionals for early diagnosis and treatment of mycetoma. World Heath Organization. Neglected tropical diseases. Available at: www.who.int/neglected_diseases/diseases/en/. Accessed May 2017. Nenoff P, van de Sande WW, Fahal AH, Reinel D, Schöfer H. Eumycetoma and actinomycetoma–an update on causative agents, epidemiology, pathogenesis, diagnostics and therapy. J Eur Acad Dermatol Venereol 2015;29:1873-1883.
van de Sande WW. Global burden of human mycetoma: a systematic review and meta-analysis. PLoS Negl Trop Dis 2013;7:e2550. Fahal A, Mahgoub el S, El Hassan AM, Abdel-Rahman ME. Mycetoma in the Sudan: an update from the Mycetoma Research Centre, University of Khartoum, Sudan. PLoS Negl Trop Dis 2015;9:e0003679. Maiti PK, Ray A, Bandyopadhyay S. Epidemiological aspects of mycetoma from a retrospective study of 264 cases in West Bengal. Trop Med Int Health 2002;7:788-792. Hazra B, Bandyopadhyay S, Saha SK, Banerjee DP, Dutta G. A study of mycetoma in eastern India. J Commun Dis 1998;30:7-11. Padhi S, Uppin SG, Uppin MS, et al. Mycetoma in South India: retrospective analysis of 13 cases and description of two cases caused by unusual pathogens: Neoscytalidium dimidiatum and Aspergillus flavus. Int J Dermatol 2010;49:1289-1296. Bakshi R, Mathur DR. Incidence and changing pattern of mycetoma in western Rajasthan. Indian J Pathol Microbiol 2008;51:154-155. López Martínez R, Méndez Tovar LJ, Lavalle P, Welsh O, Saúl A, Macotela Ruíz E. Epidemiology of mycetoma in Mexico: study of 2105 cases [Article in Spanish]. Gac Med Mex 1992;128:477-481.
van de Sande WW, Maghoub el S, Fahal AH, Goodfellow M, Welsh O, Zijlstra E. The mycetoma knowledge gap: identification of research priorities. PLoS Negl Trop Dis 2014;8:e2667. Avram A. A study of mycetomas of Rumania [Article in French]. Mycopathol Mycol Appl 1966;28:1-15. Wilson AM. The aetiology of mycetoma in Uganda compared with other African countries. East Afr Med J 1965;42:182-190. Agarwal SC, Mathur DR. Mycetoma in northern Nigeria. Trop Geogr Med 1985;37:133-135. Balabanoff VA. Mycetomas originated from South-East Bulgaria (author’s transl) [Article in French]. Ann Parasitol Hum Comp 1980;55:605-613. Kotrajaras R. Mycetoma, a review of seventeen cases seen at the Institute of Dermatology, Bangkok, Thailand. J Dermatol 1981;8:133-137. Zijlstra EE, van de Sande WW, Fahal AH. Mycetoma: A Long Journey from Neglect. PLoS Negl Trop Dis 2016;10:e0004244. Venkatswami S, Sankarasubramanian A, Subramanyam S. The madura foot: looking deep. Int J Low Extrem Wounds 2012;11:31-42. Bassiri-Jahromi S. Mycetoma in Iran: causative agents and geographic distribution. Indian J Dermatol 2014;59:529. Zarei Mahmoudabadi A, Zarrin M. Mycetomas in Iran: a review article. Mycopathologia 2008;165:135-141. Yu AM, Zhao S, Nie LY. Mycetomas in northern Yemen: identification of causative organisms and epidemiologic considerations. Am J Trop Med Hyg 1993;48:812-817. Khatri ML, Al-Halali HM, Fouad Khalid M, Saif SA, Vyas MC. Mycetoma in Yemen: clinicoepidemiologic and histopathologic study. Int J Dermatol 2002;41:586-593. Yan J, Deng J, Zhou CJ, Zhong BY, Hao F. Phenotypic and molecular characterization of Madurella pseudomycetomatis sp. nov., a novel opportunistic fungus possibly causing black-grain mycetoma. J Clin Microbiol 2010;48:251-7. Rattanavong S, Vongthongchit S, Bounphamala K, et al. Actinomycetoma in SE Asia: the first case from Laos and a review of the literature. BMC Infect Dis 2012;12:349.